Last month we had a month off from our regular ‘five positive plastic solutions’ post. So here’s a round-up of some of the great projects, products and developments we’ve discovered in the world of plastic in recent months. At last – legislation to ban pointless plastic! Finally, many European countries will soon have to stick to stringent rules about using plastic. The European parliament has voted to ban a raft of single-use plastic products, including cutlery, cotton buds, straws and stirrers, as well as single-use polystyrene cups and those made from oxo-degradable plastics. The ban will come into force by 2021 in all EU member states. The EU has also addressed plastic bottles, saying that they should be made of 25% recycled content by 2025, and 90% of them should be recycled by 2029. Hats off to Asda this month. The retail giant is making huge strides in its bid to make all its packaging 100% recyclable by 2025. As part of its pledge, clothing and homewares products will soon be made from recycled plastic bottles. Look out for cushions, throws and dresses in its Spring/Summer 19 range. And there’s more Brownie points to be awarded, as it revealed that it has reached its milestone of removing 6,500 tonnes of plastic from its own brand packaging in the past year. That’s the equivalent weight of around 600m plastic bottles. Always one step ahead, Lush is providing its customers with a brilliant solution. 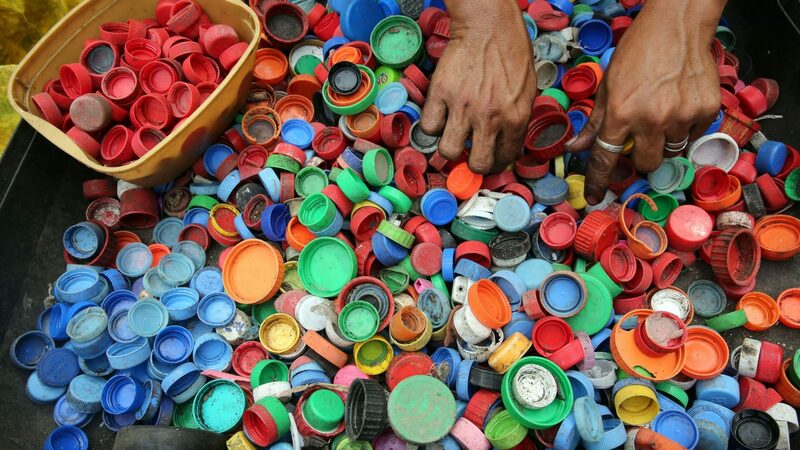 Bring your bottle tops into a Lush store and they will recycle them into funky worktops. Lush, we salute you for your efforts. Councils, please take note. A new solution for disposable coffee cups? Our love for coffee on the move leads to billions of disposable coffee cups being dumped very year. In 2011 it was estimated that 2.5 billion cups are thrown away each year. At RAW, we advocate reusable alternatives first and foremost, which means a shift in our culture. But there’s still a need for more sustainable alternatives to deal with this problem effectively from all angles. Enter a new solution: the biodegradable 3D-printed mugs made from fruit waste! The HyO-cup is made from gourds, large fruits with a hard skin that’s watertight when dried. They’re 100% biodegradable and the plants are fast growing, so can be produced on a large scale. Could this be the coffee cup of the future? As we investigated in a recent blog, zero-waste shopping is on the rise. Most of us have seen or used a zero waste shop, and their approach to buying groceries without the packaging is having a big impact on consumer shopping habits. But now this concept is being taken to a new level. How would you feel about buying ice cream or washing powder in a reusable container (stainless steel of course, the cleanest, greenest material for food) and then having it collected so it can be cleaned, sterilised and refilled for the next customer? This is the concept behind a new initiative launched by a coalition of some of the major consumer product companies, including Procter & Gamble, Nestle, PepsiCo and Unilever, in an effort to find a circular, sustainable solution to food packaging waste. The pilots start in in New York and Paris – we’re keen to see how they go and whether this is something that will hit the UK soon. Have you spotted any plastic solutions recently that we should know about? We’d love to her about them if so – tweet us at @RAWBottles and we’ll share them with our followers! Check out our previous positive plastic solutions of the month articles for more pioneering ideas, projects and products.